The Sharpeville Massacre, which occurred on March 21, 1960, in the township of Sharpeville, South Africa, was the incident that to that point resulted in the deaths of the largest number of South Africans in a protest against apartheid. It also came to symbolize that struggle. Sharpeville, a black suburb outside of Vereeniging (about fifty miles south of Johannesburg), was through the 1950s a community untouched by anti-apartheid demonstrations that occurred in surrounding towns. By 1960, however, anti-apartheid activism reached the town. In March 1960, Robert Sobukwe, a leader in the anti-apartheid Pan-Africanist Congress (PAC) organized the town’s first anti-apartheid protest. In order to reduce the possibility of violence he wrote a letter to the Sharpeville police commissioner announcing the upcoming protest and emphasizing that its participants would be non-violent. On March 21, an estimated 7,000 Africans gathered in front of the Sharpeville police station to protest against the restrictive pass laws. Nearly 300 police officers arrived to put an end to the peaceful protest. As they attempted to disperse the crowd, a police officer was knocked down and many in the crowd began to move forward to see what had happened. Police witnesses claimed that stones were thrown, and in a panicked and rash reaction, the officers opened fire into the crowd. Other witnesses claimed there was no order to open fire, and the police did not fire a warning shot above the crowd. As the thousands of Africans tried to flee the violent scene, police continued to shoot into the crowd. Sixty-nine Africans were killed and 186 were wounded with most shot in the back. The Sharpeville Massacre awakened the international community to the horrors of apartheid. 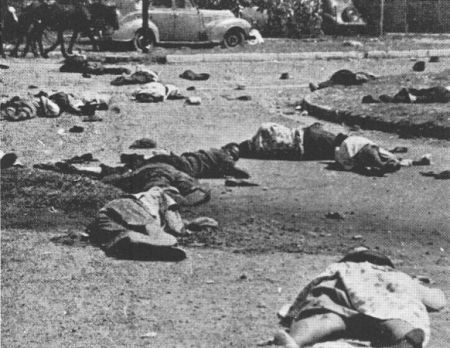 The massacre also sparked hundreds of mass protests by black South Africans, many of which were ruthlessly and violently crushed by the South African police and military. On March 30, the South African government declared a state of emergency which made any protest illegal. The ban remained in effect until August 31, 1960. During those five months roughly 25,000 people were arrested throughout the nation. The South African government then created the Unlawful Organizations Act of 1960 which banned anti-apartheid groups such as the Pan Africanist Congress and the African National Congress. The South African’s government’s repressive measures in response to the Sharpeville Massacre, however, intensified and expended the opposition to apartheid, ushering in three decades of resistance and protest in the country and increasing condemnation by world leaders. With the election of Nelson Mandela as President of South Africa in 1994, the apartheid system ended. Symbolically in 1994, Mandela signed the nation’s first post-apartheid constitution near the site of the 1960 massacre. Philip H. Frankel, An Ordinary Atrocity: Sharpeville and its Massacre (New Haven: Yale University Press, 2001); Henry F. Jackson, From the Congo to Soweto: U.S. Foreign Policy Toward Africa Since 1960 (New York: William Morrow and Company, Inc., 1982); Meredith Martin, The History of Apartheid: The Story of the Colour War in South Africa (New York: London House & Maxwell, 1962).